UNITED NATIONS, June 1 -- After less than a month as Secretary-General, Ban Ki-moon on January 19 called for an "urgent audit" of the UN Development Program, beginning in North Korea where charges of lax oversight had surfaced. On Monday, January 22, after lengthy weekend meetings, Mr. Ban significantly limited the audit, to only North Korea, and by UN auditors, not an outside private firm. As Inner City Press reported on May 31, Mr. Ban commissioned a memo from his own Department of Political Affairs which advised that "concerns over UNDP financial transactions, and other alleged irregularities in the DPRK, should be met through the coming external audit." 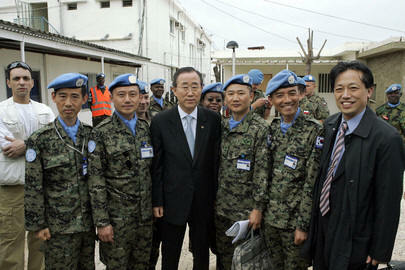 Otherwise, Mr. Ban's DPA wrote, "the UNDP program risks being terminated. Rather than being able to support the six-party talks process and international engagement with North Korea at this critical juncture, the UN will lose its unique comparative advantage in that area altogether." From this memo, and even more so from numerous interviews with diplomats and UN insiders, it emerges that Ban Ki-moon thought the better of conducting a legitimate, on-site audit of how aid funds were used under the Kim Jong Il government. Such inquiry might not only work counter to the foreign policy of South Korea, which for years until he this year became Secretary-General was Mr. Ban's focus, but now might also undermine the UN's � unique comparative advantage," one of which is presented as being Mr. Ban himself. A superficial report of audit, which may or may not be final, was released on June 1 at 11:55 a.m. by Ban's Spokesperson's office. Minutes later, the Spokesperson read out a statement that the report, which reporters had not had time to read, cleared UNDP of any "large scale diversion of funds." The UN's own News Center ran a headline, "DPR Korea: Ban Ki-moon says audit finds no large-scale diversion of funds." Only after UNDP's hit-and-run press conference, held before reporters could read the audit report, did it emerge just how limited to auditors work in fact was. They acknowledge that they "did not test the validity of payments to ultimate recipients as it does not have access to financial records outside the UN system." Para. 13(f). But the trigger for the audit was the claim that funds funneled by UNDP ended up in illicit uses, potentially in violation of UN Security Council resolution 1718. Why conduct and announce an audit that does not even " test the validity of payments to ultimate"? While various UN official have repeatedly evaded questions about whether the UN auditors were barred from North Korea, the report finally discloses, quietly in its Paragraph 75, that Ban's chief of staff Vijay Nambiar on March 12 diplomatically asked North Korea for "assistance with travel arrangements" for the auditors to North Korea. On March 20, as never disclosed until this report, the Kim Jong Il government advised Ban's chief of staff that North Korea "was not going to extend any cooperation to UNDP's audit." So the auditors were not allowed into the country at issue, and yet purport to exonerate UNDP. This despite the disclaimer that "no complete set of financial statements of the UN-related DPRK activities were submitted for audit" and "the audit was limited to personnel and documents made available in New York." "paid directly to a local staff member who would cash the check and distribute the cash to local personnel. As the supporting documents for these payments were not kept in the headquarters in New York, the Board [of Auditors] was not able to verify any controls exercised over these payments." So which is it? Did Timo Pakkala bring from Pyongyang all relevant documents? Apparently not, see Paragraph 27 as well, in which the auditors note that "annex 1, which was to describe the scope of services, was not provided to the Board." UNDP paid in Euros in North Korea, and the report at Paragraph 55 (c) says that UNDP's "Euro account was funded from UNDP Headquarters." But then in Paragraph 68 the report says that "all payments made from the Euro, convertible Won, and non-convertible Won accounts for the period 2002-2006 have been recorded as manual check payments. No checks were held in New York, therefore, in this phase, the Board did not have access to the paid checks." First, if the Euro account was "funded from UNDP Headquarters" in New York, why were none of the checks in New York? Second, even assuming that were true, why didn't Timo Pakkala bring the checks with him to New York, to meet with the auditors? Timo Pakkala was, among other things, in charge of the safe at UNDP Pyongyang in which counterfeit U.S. currency was secreted. The report explicitly says that counterfeit is beyond what it considered. Inner City Press has asked, aren't inventories including safe contents filed within UNDP? Mr. Morrison has said "no," but UN sources with direct knowledge of the issue have told Inner City Press that such reports were filed every June and December, with UNDP finance director Darshak Shah. The report is signed by Philippe Seguin of France, Terence Nombembe of South Africa and Guillermo Carague of the Philippines, the bosses of actual auditors Martine Latare, Odette Anthoo and Dioni Abalos, respectively. Mr. Morrison declined to confirm that head auditor P. Brodeur has left his post. Since Brodeur was the person slated to present the report to the ACABQ, and to the press, it is not clear what now will happen. The report says that "during this preliminary phase, the Board did not perform alternative procedures to confirm whether all payments were released in fall by the Government of DPRK to the staff members." Paragraph 37. This was a key question to be investigated: whether the money UNDP paid the government, supposedly for staff, was every paid to them. Since these was not checked, the report cannot legitimately make any finding about how the money was used. And yet exoneration is claimed, in part so that Ban's UN can get back to their "competitive advantage." This despite the finding, buried in Paragraph 60 of the report, that "contrary to Article 6 of the Standard Basic Agreement, UNDP made local payments in foreign currencies." The report states, in Paragraph 65, that "the information supplied was not verified, and no source documents were examined during this phase of the audit." How can it even be called an audit then? Inner City Press posed this and other questions to UNDP spokesman David Morrison Friday at a hastily scheduled press conference. Despite several written requests in recent days, Mr. Morrison still could not or would not describe what UNDP has called its "biodiversity" program in North Korea. Inner City Press asked Mr. Morrison to confirm or deny that UNDP, through chief legal officer James Provenzano -- who was still to rule on a filing Inner City Press long ago made under UNDP information disclosure policy -- and UNDP legal staffer Peri Johnson, threatened a UNDP North Korea staffer with termination and expulsion from the U.S. for having blown the whistle. Video here, from Minute 15:10. "I am not aware of it," Mr. Morrison said. "I have seen your question." Then why had he never answered or acknowledged the question? Inner City Press advised him to "ask Peri Johnson." We'll see.